The Power Parade begins with a pair of GP-20's leading a westbound freight out of the yard in July 1965. The lack of dynamics seems odd to me now; it was the norm on The Water Level Route. An all Alco consist leads a freight out in August 1965. A lone RS-2 is sandwiched among FA-2's and an FB-2. A better side view of the FA-2 leading the train shown above. A DL-701 spliced between an FA-2 and an FB-2 spice up this Alco consist in July 1965. Two EMD E-7's (an A and a B) lead this mail and express train past the yard tower in August 1966. An E-8 leads this intermodal train in March 1967. Who would believe it, that 30 years later, a very lucky person could still see E Units pulling intermodal. A GE U-25B trailing other GE's on a container train in May 1967. An EMD GP-30 leads a GE U-28B past the tower in September, 1967. Close inspection of the skyline casing of the Geep reveals that the dynamic brake blister has been blanked off since this engine does not have dynamics. Also, it was fairly rare for the Central to mix power by different manufacturers. An EMD GP-40 brings up the rear of the above consist. 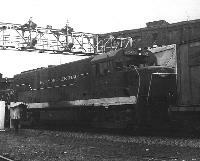 Note the dynamic brakes on this Geep -- perhaps in anticipation of the Penn Central merger. The Penn Central merger is evident here with the Pennsy caboose on the end of a freight in September 1968. Note the open ice hatches on the reefer just ahead of the caboose. That's an Alco S-2 switcher working a cut of TOFC.